A still from a video explaining how entrepreneurs hope to re-park an ailing satellite to provide free Internet for developing countries. Oneman's bankrupt satellite company is another man's opportunity to spread freeInternet across the world. That's the hope of Kosta Grammatis, CEO and founderof ahumanright.org, who sees having an Internet connection as a basic necessity— in fact, a human right — for every global citizen. Grammatisis raising $150,000 to create a business plan for buyinga communications satellite and moving it to a new orbital slot to providefree Internet service to developing countries. He has his sights set on theTerreStar-1 satellite: a spacecraft the size of a school bus that launched in2009 and is owned by a company that filed for Chapter 11 bankruptcy protectionin October. Theidea of making free Internet available to all may sound like a pipe dream, butGrammatis has the right combination of technical background and ambition forthe job. His resume includes working as an engineer for private spaceflightcompany SpaceX,as well as creating a bionic eye camera to transform a one-eyed filmmaker into"Eyeborg." Grammatisand his team plan to pay the bills by allowing telecommunications companies tobuy and resell high-speed bandwidth, even as they provide a slower connectionspeed for free to everyone. They have also begun to develop an open-source,low-cost modem that could provide developing countries with their link to thesatellite and the rest of the world. 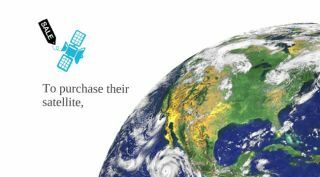 Toachieve this dream, ahumanright.org launched a "Buy This Satellite"initiative on a new website. SPACE.com: What are thebasic goals of ahumanright.org? SPACE.com: How muchgeographical coverage can TerreStar-1provide in terms of Internet? Could it provide service to all of Africa? Grammatis:Currently it can cover all of America, southern Canada and northern Mexico. Not entirely Africa. SPACE.com: Whatconsiderations are going into the choice of where to park the satellite? Howwill you weigh public or donor opinions? Grammatis:That is a very complicated question that has no simple answer. SPACE.com: How much do youenvision the open-source, low-cost modem might cost? Grammatis:We're aiming for less than $100, but that's dependent on a lot offactors. SPACE.com: Do you have anybusiness partners or larger-scale funders in mind? Grammatis:Plenty. Google comes to mind first, RichardBranson second. People and organizations who like taking big risks anddoing things that have a lot of positive impact. SPACE.com: Are there anypossible plans to repeat this process for other satellites, if this ultimatelyproves successful? Grammatis:Already in the works! We've got another collaboration coming together thatshould be announced soon if things go as planned. Tocontribute to "Buy This Satellite's" goal of raising $150,000, go here.